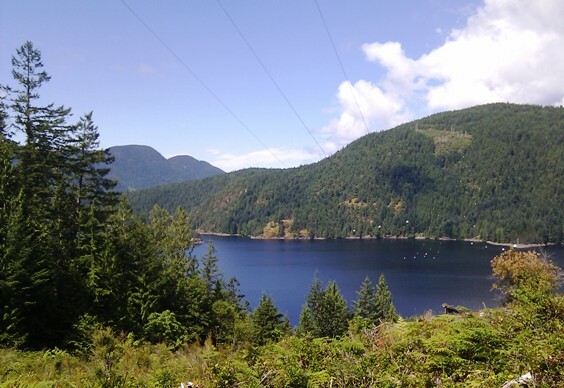 For the purposes of this website Pender Harbour trails include trails north of Kleindale from about Garden Bay Road north. Officially Pender Harbour includes the communities of Madeira Park, Kleindale, Garden Bay and Irvine's Landing. Although there are relatively few trails in this area, Pender Harbour trails include some of the nicest on the Sunshine Coast. Birdie connects off the Suncoaster Trail, just past the bridge off Hallowell FSR heading towards Sakinaw Lake. Takes you up to the powerlines. Bogie follows an old logging road bed from the Suncoaster Trail and down to Hwy. 101. It comes out just northeast of the golf course. When you get to the powerlines the trail goes off to the right a bit and then at the fork you stay left. The right fork ends up at a dead end. Duffer connects the Suncoaster Trail to Lion's Park. Another old logging road bed, it also crosses the powerlines and just past the trail cuts into the bush on the right. It's marked with a ribbon, but is a little hard to see. If you get to the creek and the fence then you've just missed it. Go back 20 paces or so and you will see the small trail. There is quite a network of trails in this area, most of which seem to end up in Lion's Park. This is a very pretty trail that cuts down from Hallowell FSR to the end of the Suncoaster Trail that takes you out to McKay Rd. and Hwy. 101. Another Pender Harbour trails hill climb, approximately 1.5 kms each way. Quite a good workout and will likely take between 40 minutes to an hour up. Check out the Mt. Daniel page for more details. This is a short connecting trail between the powerlines back down to the Hallowell Forest Service Road. Some of the most beautiful views of Pender Harbour from the top of this trail. Kind of a short version of Mt. Daniel with just as nice or prettier views. Take Garden Bay Rd. approx. 9 kms and at the fork keep right on Irvines Landing Rd. Turn right on Lees Bay Rd. and follow it maybe a kilometre or so to a road on your right. You'll see a small parking area and it is well signed from there. This world renowned trail is probably the most well known and hiked trail on the Sunshine Coast and as such has a page all of its own. Click here for more details. Click here to return from the Pender Harbour trails to the Sunshine Coast Home page.